255 p., 6 ill., 14,7 x 20,8 cm. 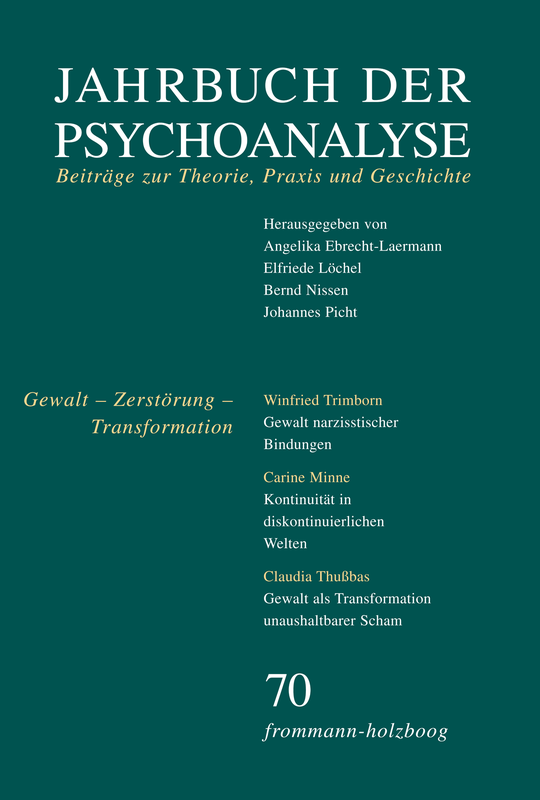 With contributions by Thomas Auchter, Gerhard Dahl, Rolf Haubl, Ilany Kogan, Carine Minne, Tülay Özbek, Cosimo Schinaia, Claudia Thußbas and Winfrid Trimborn. The extent and the steadiness of violence and aggression in intimate partnerships cannot only be understood through external traumatic or social influences. The author describes how the complex narcissistic defensive organisation as a result of traumatic intrusions into the early ego itself becomes a threat and produces violence and aggression. The starting point of this defensive organisation is a regressive-imaginary fusion of the ego with an idealised (primary) object. Against the anxieties provoked thereby, sadomasochism and negativism have to be evaluated even as stabilizing factors. The symbiotic omnipotence that is defended against a threatening depression is characteristic of the fusion to a dual union. The article examines the question of whether an act of violence may have the function of transforming extreme, unbearable forms of shame (for example, the shame of existing) into moderate forms of shame. A concept was developed in an interplay of theoretical and psychoanalytic reflections on shame and descriptions from a psychoanalytic treatment, which should describe the function of a single physical act of violence of an analysand in her psychoanalysis as part of their overall development. With her act of violence, the analysand psplitted off her shame of existing and projected it onto the analyst. Both the splitting and the conversation about the humiliation of the analyst through the violence enabled the analysand to feel and to show a new form of shame. It is believed that splitting shame plays an important role in acts of violence in close relationships, such as in the development of domestic violence. Due to the intimidation of victims and their silence, however, there is usually no chance of a change. On the basis of Rachel’s psychoanalytic treatment, the author demonstrates how she managed to deal with the deeply troubling affects she experienced in the work with her patient. Rachel’s great creativity was especially helpful for this, as it appeared in dreams, poems and paintings that she brought into the sessions. The visible fear of both separation and relationship therein were shown as anger. Rachel, however, was only able to express them when she was convinced that her analyst would be able to survive and that their relationship would persist. This is a clinical paper to illustrate the benefit of long-term continuity of psychotherapy in a severely disturbed young man who committed matricide. In such disturbed and disturbing cases, short-term interventions cannot lead to the internal world changes required for the patient to become reliably better, eventually able to live in the community again and for the risk of re-enactment of violence to be adequately contained. The helpfulness of the OPD-system for multi-disciplinary professionals who are not psychotherapeutically trained but involved in the patient’s care is stressed. The media presentation of adolescent violence does not withstand the test of reality, because only a very small proportion of young people are permanently violent. After a determination of the terms ›adolescence‹ and ›violence‹ in this paper, the forms and functions of juvenile violence are investigated. The personal expression of adolescent violence is the product of a life history of experience in all developmental phases. Individual adolescent experience is always embedded in specific historical, social and cultural conditions. A differentiated view brings to light that it is possible to differentiate positive and negative, respectively, benign and malignant aspects in aggression, destruction and violence. Inspired by Donald W. Winnicott, the self-regulating and relationshipregulating aspects of aggression and violence are especially emphasised. In this paper I try to pursue the phenomena of violence in the migration process over three generations. Often psychic processes are affected and triggered, which are felt as violent and overwhelming by the subject, without an act of physical violence preceded it. Since I assume that the forms and the experience of violence in the migration in each generation have a different focus, I have tried to describe this following the division of the generations. Boredom is a widespread but relatively little explored mood. It is often underestimated in its effects, especially in its chronic, unbearably agonizing variant. The empirically well-documented correlation between boredom and aggression, against oneself and others, is disturbing. The paper describes, in a first step, this variant of boredom as a conflictual action inhibition, which manifests itself in a multifaceted phenomenology, psychodynamics and sociodynamics. In a second step, the paradigmatic case is discussed where a violent person justified her destructiveness by the argument that she was bored. Finally, in a third step, the social conditions of boredom are brought into perspective: The thesis outlines that late modern society commands its members to be not boring, thereby increasing boredom and making it hardly bearable. The term »paedophilia« never appears in the analytical index of Freud’s works; nor does it in the works of Melanie Klein, Winnicott or Bion. Moreover, a study I have carried out on the fifteen most popular English psychoanalytical journals reveals that, with the exception of the last few years, very few articles have been written on this subject. The core of my essay is the distinction between paedophilic perversion and paedophilic perversity. The perverse symptomatology acquires a different expressiveness related to the fact that it belongs to neurotic, borderline or psychotic pictures. It is possible to find in perversion (though on different levels) a capacity for representation which is reduced, yet still preserved, if only partially, while the features of sexual perversity are mainly the lack of capacity for thinking and symbolising. The perversity is characterized by the self falling apart. At the beginning of his research on the genesis of a neurosis, Freud was faced with the serious problem of differentiating between empirically verifiable, real sexual traumata and merely imagined ones. The nature and function of phantasy thus became the most delicate question of psychoanalysis. With the libido theory, Freud first developed a conception of the psyche as an energetic and independent system, which works according to the economic rules of the pleasure principle. This theory was to fulfil the accepted methods of natural sciences at that time and secure psychoanalysis the recognition as a legitimate science. However, Freud’s initial conception of psychoanalysis failed at the problematic conception of orality as merely a fictitious and constructed phase of organisation. The author argues that Karl Abraham’s findings about the destructive aspects of orality, albeit initially met with some reservation by Freud, contributed to Freud’s essential and irremissible revision of the libido theory, which might also answer the delicate question of phantasy: beyond the economic pleasure principle. The reception of the third theory of the instincts and the advancement of the death instinct hypothesis by Melanie Klein and her successors no longer focus on energetic and economic principles of the psyche, but rather on the clinical utility and practical value of the theory.